Andor Shamrock 163 Imaging Spectrographs is the most compact research-grade Czerny-Turner spectograph on the market. Available for use with a wide range of cameras: Including – CCD’s, EMCCD’s and ICCD’s. 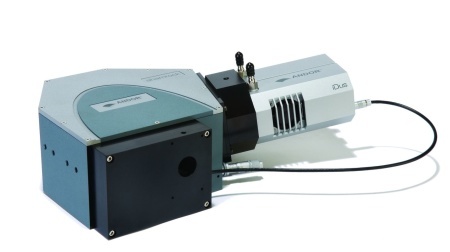 Coupled to Andor’s compact, high performance USB 2.0 camera, the iDus CCD detector system, the Shamrock 163 spectrograph provides the ideal tool for absorption/transmission, fluorescence, reflection and source characterization. The Shamrock 163 spectrograph is also available as a stand-alone option for use with an existing or third party CCD or array detector.